...really he does. 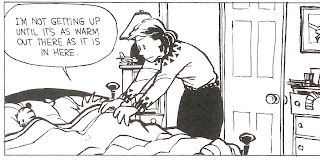 Today Bob came across this Calvin and Hobbes comic then commented he was going to enlarge it and hang it over our bed. I can't imagine living through a winter as cold as you get in the Northern Hemisphere. The coldest that we ever really drop to is about 10 degrees celcius [not sure what that equates to in Fahrenheit]. Oh, I so get you too! Is winter over yet?